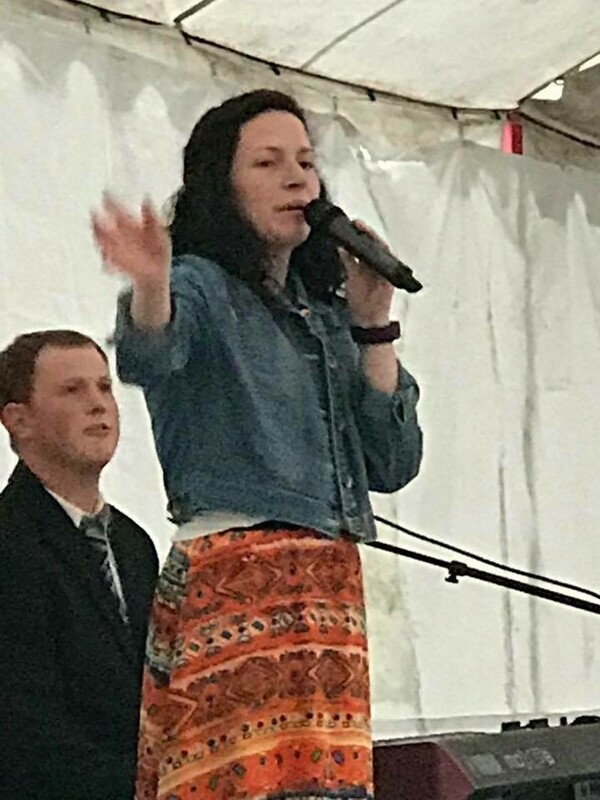 Brush arbor meetings, tent revivals or camp meetings – they go by various names, but outdoor church services are a summertime tradition across Appalachia, including here in Alleghany County. Roger May, an photographer and writer who has devoted his life to documenting the people of Appalachia says this about these meetings; “I think tent revivals are a beautiful thing, often misunderstood, and unfortunately, quickly fading. In a world full of digital consumption and mega churches, there seems to be little interest in the old ways of worshiping, of gathering, and of holding these kinds of meetings. There is something special about documenting it that allows me to sort of be suspended between the preacher and the audience. Bearing witness to this has been incredibly powerful.” May documented his experiences visiting tent revivals in a blog entitled Glory. Locally, there are upcoming opportunities to become familiar with this unique worship experience. A second opportunity is offered by Pine Fork Baptist Church on their church grounds at 8791 NC Highway 18 South near Laurel Springs. Dr. Phil Kidd from Grey, Tennessee will lead these services on August 15-17 at 7:00 pm each night. There will be special singing each evening. Traditionally these tent meetings were a means of reaching people who may have felt uncomfortable attending traditional church services. Evangelistic in nature and purpose, they also furnished an opportunity to spend time with friends and neighbors, and to hear guest preachers and good singing during the late summer months before harvest season. While these meetings may seem old-fashioned and even antiquated to some, their message of renewal and authentic connection is timeless. #1 Be a part of a longstanding mountain tradition. String music and fiddlers’ conventions are an integral part of Appalachian culture and even more so in Alleghany County, the Heart of the Blue Ridge Parkway. These gatherings give neighbors opportunities to get together to share tunes and reestablish old friendships. Toss in some friendly competition and you have a fiddlers convention. As you wander through the campground, you will be treated to a variety of very fine old-time and bluegrass music. Do you play or are you a budding musician? Most jams in the camping area are welcoming to newcomers. Keep in mind there is usually informal etiquette that may vary from group to group. General jam etiquette can be found here. #4 You will feel welcomed. From the volunteer firefighter who helps you with parking to the lady serving a made to order funnel cake, you will experience a sense of belonging to our community. In fact, this welcoming, family friendly atmosphere is often given as the number one reason people return year after year. The Alleghany County Fiddlers Convention is more than a music event. Music and dance help balance culture and erase class boundaries. This event is a place where new friendships are formed and old ones strengthened. It has a “come as you are” air that is a unique part of mountain life. It is a truly Authentically Alleghany event! Who would want to miss that? For information on lodging, restaurants, and other retail needs, visit the Authentically Alleghany website here or contact the Alleghany County Chamber of Commerce at 336-372-5473. As temperatures climb toward triple digits off the mountain, the New River becomes increasingly inviting. The cool waters welcome visitors with a variety of recreational opportunities. Clear, low water levels make for outstanding fishing for Smallmouth Bass. Public access points can be found at the New River State Park on Kings Creek Road and at the NC Wildlife Resources Commission’s public fishing access area on Farmers Fish Camp Road. Wading anglers are encouraged to wear personal flotation devices (PFDs) as water depths can vary greatly. North Carolina and Virginia have a reciprocal fishing license agreement that applies from the confluence of the North and South Forks of the New downstream to the Little River. Fishing regulations from North Carolina can be found here and Virginia’s here. 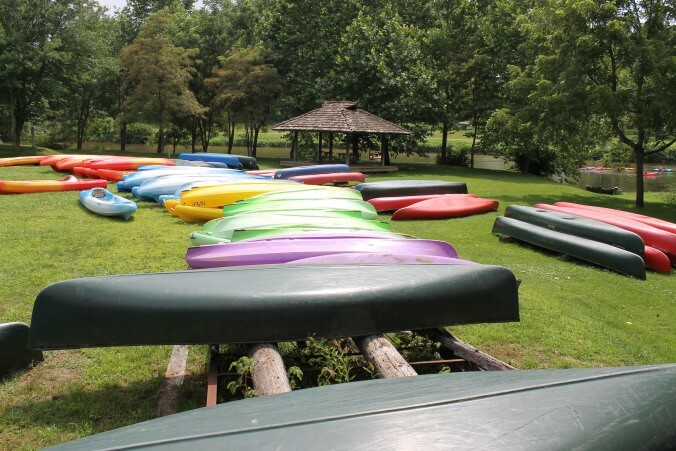 Canoeing, kayaking and tubing offer a sure way to cool off on a hot day. Rentals and shuttles are available at Rivercamp USA, the New River Campground, and Dusty Trails Outfitters. They can tailor trips around skill levels and/or time restrictions. PFDs are required on canoes and kayaks. Young boaters under age 13 must wear a properly sized PFD while afloat. One the more unique opportunities along the river is the canoe access campground that is part of the New River State Park. This allows paddlers a chance to get away from the crowds and enjoy the solitude of the river in a quiet setting. So, whether it is paddling, wading, floating or camping, the New River in Alleghany County has something for everyone. The next two weeks bring many opportunities to experience an Authentically Alleghany 4th of July. The events range from a traditional Independence Day parade and fireworks display to those that are unique to our community such as lawnmower races and canoeing the New River. The diversity of those events fuel a question that often arises – what does “Authentically Alleghany” really mean? Does someone have to be a lifelong resident to be considered authentic? Does an event have to have a long history and fit a certain criteria to be labeled authentic? Or are we open to newcomers and new events? As part of our recent branding study, we surveyed local residents and asked what attributes define Alleghany County. The responses fell into several broad categories: outdoor recreation, cultural heritage, the arts, and a relaxing environment that is family friendly. And of course, geographically, we are the Heart of the Blue Ridge Parkway. Our events reflect those attributes. That leads to the more challenging question of who is Authentically Alleghany. The scheduled events give insight into that question. Those who consider themselves authentic to our county embrace the community and seek ways to plug into community activities. They can listen quietly as an author reads from their work, cheer as their neighbors’ race lawnmowers, paddle the river with their family, or “ooh and ah” from the tailgate of a pickup truck as fireworks light up the sky over Sparta. We do these things to support local organizations such as volunteer fire departments or schools and as simply a way to connect with our community. No single event or group stereotypes who we are and what it means to be a part of our county. We are community of deep rooted families and recent transplants. We can make lots of noise or sit quietly. We embrace our past but are not bound by it. This year’s 4th of July parade theme describes us perfectly – United We Stand. Roll that all together and you define Authentically Alleghany. The Alleghany Historical Museum is for the 2018 season. The current exhibit features Arrowheads from Jeff Jolly, Butter Dishes from Jettie Royal, Ceramic Pigs from the Halsey Family, Coffee Cups and Mugs from Jeremy Halsey, Dr. Grabow Pipes from Ryan Lane and Gracen Lucas, Drug Store Merchandise from Kermit Pruitt, Flow Blue China from Cindy Atwood, Juicers from Nancy Hunt, Milk Glass and Carnival Glass from Claire Halsey, Pottery from Joyce Speas, Shot Glasses from Lucy Roe, and Thimbles from Virginia Setzer. In addition to the loaned collections, many other pieces from the Museum’s own collection are currently featured. Many photographs, paintings, furniture, work implements and other materials which illustrate the life, conditions, events and activities of the past are on display. The Alleghany Historical Museum is a project of the Alleghany Historical-Genealogical Society. Located at 7 North Main Street, it opened in 2010, after the County’s Sesquicentennial’s Celebration in 2009. Stay up to date by following the Alleghany Historical Museum on Facebook. The Museum will be open each week, from Thursday through Saturday, from 10am-5pm, until Christmastime. A recent Forbes.com article listed Sparta as one of seven places in the United States noted for a low cost of living and ideal for entrepreneurs to set up shop. The article specifically mentioned the availability of gigabit, fiber optic Internet service as a primary reason for Sparta making this list. Sparta town manager, Bryan Edwards offers insight into this resource. This creates opportunities for an increasingly technological workforce to live here and work anywhere. An example is Zach Barricklow. Zach and his siblings founded Versado Training. They conduct training for corporations around the world and were recently recognized as an Inc 5000 Fastest Growing Private Company. The fiber capability in Sparta allows Zach fast download/upload speeds and excellent video connection. This allows Zach’s family to enjoy a home in an intimate community filled with outdoor opportunities. 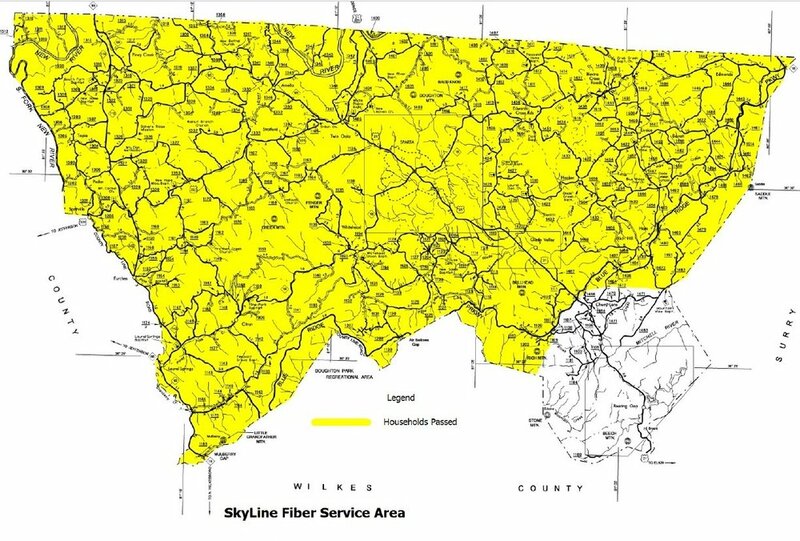 So whether you are looking for a place to work from home or just enjoy the latest movie streamed directly into your home, Alleghany County’s fiber availability will furnish gigabit speed and uninterrupted service. June brings two opportunities to enjoy Alleghany County’s finest golf courses and to assist with the fundraising efforts of two local non-profit organizations. On June 19th, Alleghany Junior Appalachian Musicians (JAM) will host a golf tournament at High Meadows Golf and Country Club. Lunch for golfers will be served at 11:00 am and the tournament begins at 12:00 pm. Dinner and a concert featuring Wayne Henderson and Friends, the Harris Brothers, and the Alleghany JAM student will follow that evening. For more information on sponsorship opportunities or to register for the tournament, visit www.AlleghanyJAM.org. Alleghany JAM serves an average of over 80 children per semester from all three elementary/junior high schools in Alleghany County, as well as home schooled children. Grades 3-8 are eligible with newer classes also available for high school students. Classes currently meet Mondays and Thursdays, 3:15-5:30 pm at Sparta Elementary School in Sparta, NC. Lessons with master traditional musicians include guitar, fiddle, mandolin, banjo, dulcimer, bass, clogging and singing. There is also a traditional arts class where kids learn about additional Appalachian cultural arts. Students take classes twice per week in both an instrument and enrichment area. Class fees operate on a sliding scale based on school lunch status. On Friday, June 22, the Alleghany Wellness Center will hold their annual golf tournament at the New River Country Club. The format is 4 person captain’s choice. Entry fee includes breakfast/lunch, beverages, goodie bag and more! Various sponsorships levels are still available. For more information, please contact Alleghany Wellness Center - 336/372-2944 or Kay Choplin - 336/657-2052. Alleghany Wellness Center, Inc. provides opportunities to our community to achieve and maintain healthy lifestyles through health education, medically-supervised programs, and facilities for physical activities and recreation. We are a 501(c)(3) non-profit serving the people of Alleghany County and surrounding areas. Visitors to Alleghany County are often encouraged to slow down and enjoy a more leisurely pace. Whether they are floating the New River, shopping the quaint shops of Sparta, or enjoying a round of golf, slowing down allows the senses to acclimate to mountain life. While this can be accomplished in many venues, few places rival a walk in the woods to get one reacquainted with the land. Fortunately, there are several options for walkers, hikers, or trail runners to enjoy nature at its best. An obvious choice is the many trails along the Blue Ridge Parkway. Those trails range from a short, easy ¼ mile walk to a beautiful overlook at the Fox Hunter’s Paradise to a more challenging and strenuous hike into Basin Cove. 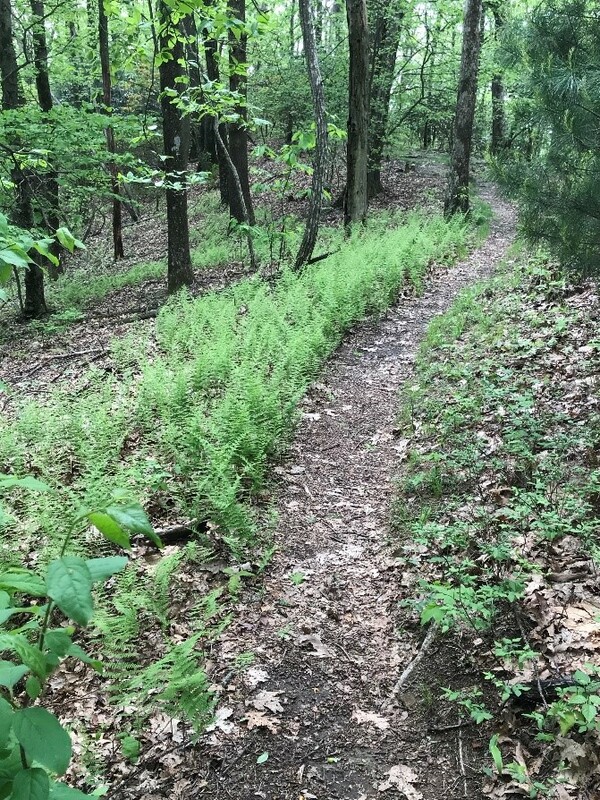 Many fern lined trails parallel the Parkway and are suitable for hikers of all ages. See maps below. The Mountain to Sea Trail (MST) weaves back and forth across the Parkway from the north before dropping down into Stone Mountain State Park. The 1175 mile long trail begins high in the Smoky Mountain National Park at Clingman’s Dome and winds across North Carolina to Jockey’s Ridge on the outer banks. The Alleghany Sparta Trails Association maintains a large section of the MST that passes through Alleghany County. One final option is to drop off the mountain to Stone Mountain State Park and hike the Stone Mountain Loop Trail. This strenuous, 4.5 mile hike crosses the summit of Stone Mountain, passes by the historic Hutchinson Homestead and then takes hikers up past a 200 foot waterfall. While geographically this hike is “off the mountain” as locals like to say, over half the trail is in Alleghany County. So, slow down and step into the Heart of the Blue Ridge Parkway.